Ambrose Heal. 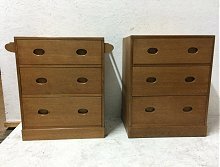 A super quality pair of Cotswold oak petite chests of drawers with cup handles with exposed dovetail construction to the top edges, one having hanging rails to the sides, a place to hang garments, ties, scarfs or towels. Height 30”, Width with rails 29" without rails 24" Depth 17"
Gordon Russell. Broadway. Arts and Crafts cheese board made of ash and a walnut desk pen tidy. Cheese board: height 15, depth 9"
An oak dining suite attributed to Gordon Russell or possibly by Eric Sharp. Consisting of a low sideboard with amatching table and six armchairs, sculpturally carved and finished to a very high standard. Dining table, 76cm high, 158cm wide, 82cm deep. 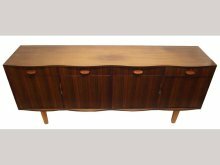 Sideboard, 81cm high, 136cm wide, 43cm deep. Circa 1920. Height 30", Width with side flaps down 41 1/2", Width with side flaps up 63 1/2", Depth 26 3/4". Circa 1922. Heals. A good quality large boardroom or dining table with a curvaceous Rosewood top on chrome twin pedestal legs with angular feet. Original Heals circular disc to the underside. 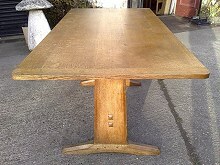 Height 29.5", Width 129", Depth 48"
‘Hayrake’ Oak Dining table. Design number X133, made be C. Beadle. Octagonal legs, and with 'hayrake' stretcher, Russell Workshops paper label underneath. 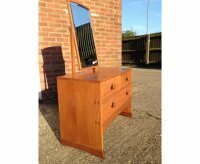 An Oak Dressing table and stool, with shaped handles, central mirror flanked by four drawers, on octagonal legs. The dressing table: 56' across, 18.5' deep. The stool: 19' high, 19.5' across. 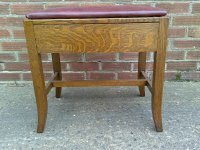 An Oak Stool, drop-in seat shaped cross stretcher. Dimensions: H 35", W 37", D 37". A rare Heals oak cricket table. Height 26", Width of top 30". Circa 1900. Gordon Russell Broadway. Designed by W.H Russell FSIA. A mahogany 'Burford' dining suite, comprising of a low side board, with serpentine front; six dining chairs and an extending dining table with one leaf. Cabinet maker C.E Grantham, design number R818, Date July 1968. 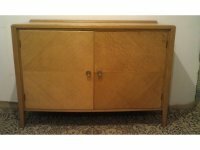 Sideboard Height 32" , Width 81" , Depth 19". Table Height 30", width 70", depth 40.5". 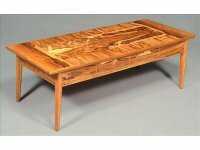 A Heals Long Tom rosewood coffee table with abstract designs inlaid with various patchwork woods. Height 14" , Width 60" , depth 16". 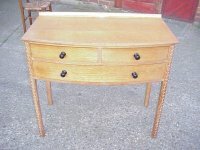 An Arts and Crafts oak chest of drawers, stamped Heals of London. Heals. 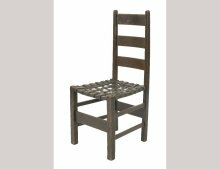 A quality lattice back oak dining/desk chair. Gordon Russell. An Ash and rush seat stool. Height 21", Width 23", Depth 14". Edward Barnsley. A set of six Acorn Industries dining chairs with leather drop in seats. A Heals oak tallboy with hanging space to the left and a fiited drawer section to the right. Height 51" Depth 20 1/2" Width 39 1/4". Circa 1930. A rare Heals sidetable with extending slides to each end with a lower shelf on slender tapering legs. Height 24" Length 27 1/2", closed, Length with slides out 46", Width 16 1/2". Circa 1930. Heals. 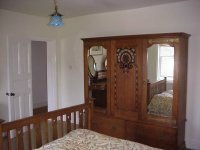 A near pair of Arts and Crafts 3' wide single beds with carved heart details, one with a carved tied knot. Height 42", Width 36". Circa 1900. Heals. Attributed. 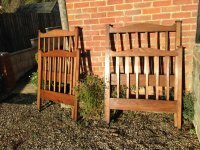 A pair of Arts and Crafts single oak 3’ wide beds with slatted head and foot boards. Height 54.25", Width 36". Circa 1900. 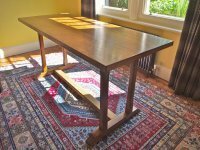 An Arts and Crafts oak refectory table attributed to Heals. Length 6' Width 30". Circa 1900. 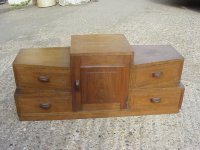 A sweet little Cotswold School dressing table, with through tennon and exposed dovetail details on seldge style feet, attributed to Edward Barnsley. Height 53", Width 32 1/2", Depth 22". A rush seat side chair attributed to Heals. Gordon Russell. attributed. A quality Arts and Crafts Cotswold School Walnut trolley with stylised floral carved details. Height 30", Length handle to handle 34", Depth 15". Circa 1920/30. 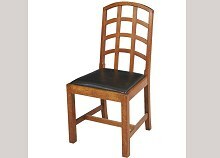 A good pair of Arts and Crafts oak side chairs by Ambrose Heals with Pewter and Ebony inlays. See Hoffmann, Julius, jnr. ‘Der Moderne Stil’ Stuttgart 2006, p. 103, fig. 5 for an illustration of the dressing table and side chair. A long run of Lattice back oak armchairs attributed to Heals of London. The arms sit back further than usual allowing them to be pushed closer to the dining table or desk. I have 21 in stock and will sell individually. Height 36". Depth 19 1/2", Width at arms 22 1/4" Height of arms 26", Length of arms 13 1/2", Height of seat 18". GORDON RUSSELL, DAVID BOOTH AND JUDITH LEDEBOER. A good quality petite oak sideboard with diamond detail veneers to the doors and a subtle curve to the front. Height 33", Length 4', Depth 19" at the centre". Heals, attributed. 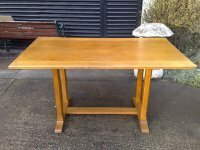 An Arts and Crafts light oak six to eight seat refectory dining table with pegged construction, good quality. Length 54", Width 30". Circa 1920's. 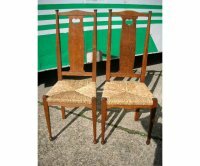 W. H. (Curly) Russell (1906-1971) for Gordon Russell, three oak recliner armchairs, designed 1930, three re-upholstered in fawn leather. 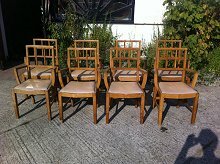 Nine more ready for upholstery £1400 each, I can arrange upholstery on your behalf. single oak wardrobe/kitchen cupboards made by Heals and Son. Circa 1930's. I also have a double version of this in stock. Approx measurements :- Height 6', Width 22", Depth 28". Heals. 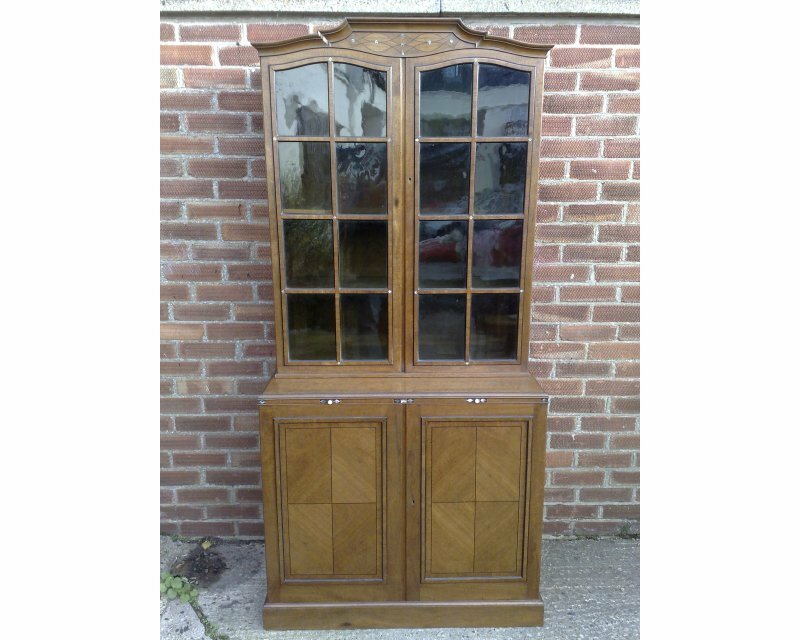 An octagonal oak cocktail cabinet with central shelves and side doors, opening to reveal bottle and glass holders. Height 22" , Width 22.5" , Depth 22.5". Heals, attributed. 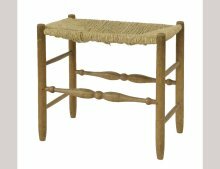 Arts and Crafts Cotswold stool with drawer and splayed legs united by H stretcher with protruding exposed details, professionally re upholstered in a quality hide. A good quality well designed oak Arts and Crafts armchair attributed to Ambrose Heal with six legs that genly flare to the feet and a single heart cutout to the head rest. I have had it professionaly re-upholstered in a quality deep Green leather. Gordon Russell. A Gunstock Walnut sidetable with original Broadway label. superb quality. Height 17 3/4", top 24" x 24". Circa late 1920's. Heals. 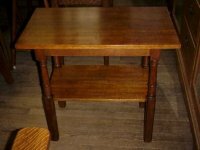 Arts and Crafts oak octagonal side table with eight legs all with chamfered details and well excecuted cross stretcher's which precision mitres into the legs. Height 28", Width 26", Depth 26". Circa 1910. 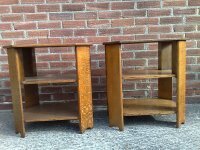 A pair of good quality Heals and Son oak side tables with good figuring to the grain. Height 25", Width 24", Depth 18". A Heals and Sons oak Torchere/plantstand with exposed biscuit joints to the top and square legs. Although unmarked this came from Overstrand Hall in North Norfolk a magnificent house built in the true Arts and Crafts style designed by Sir Edward Lutyens and built between 1899 and 1901. It was turned into a convalescent home in the early 1930's and furnished by Heals. Heals. 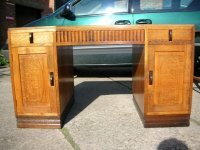 A Limed oak bureau bookcase with glazed upper section the fold down front with self opening supports opening to reveal writing area and a storage section to the back with a small central drawer and three large drawers below with tinted green moulded details to the block handles, the whole stood on sledge style feet. H - 72", W - 27", D - 18"
A rare Heal and Son pure Aesthetic Movement ebonised bedside cupboard with marble top and incised gilded decoration with a subtle Dr C. Dresser influence. Stamped Heal and Son London to the top of the door. 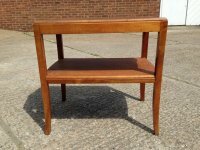 A robust Heals and Son Oak Arts and Crafts oblong sidetable with lower shelf on turned and square legs. Depth 17 1/2", Width 30", Height 27". Circa 1890. A Heals and Son Limed Oak 3' single bed with Linen fold details to the centre panels. 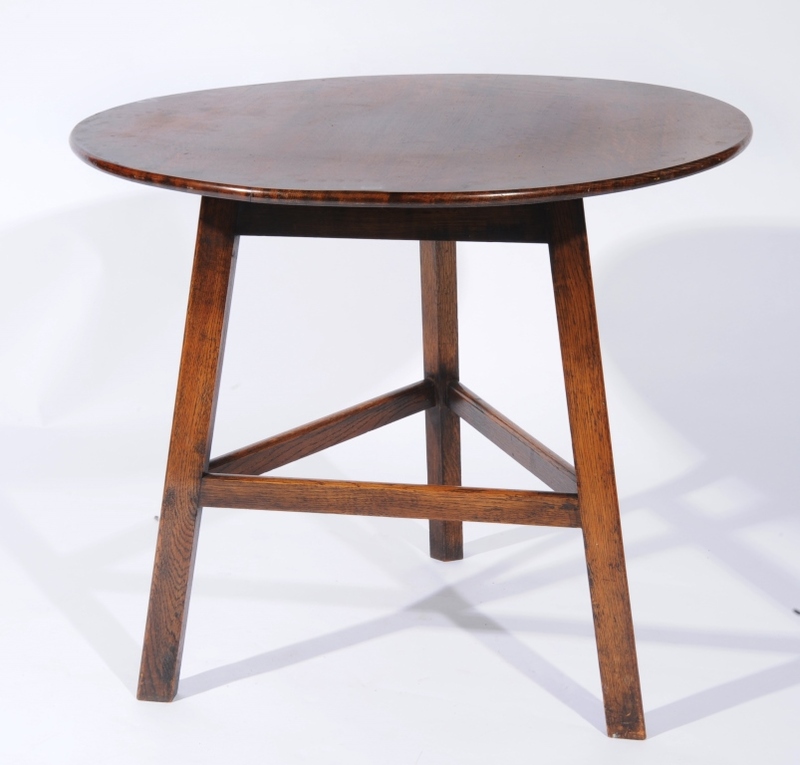 Gordon Russell, a figured yew wood coffee table, 1950s, the apron with chequer inlaid lines, on part chamfered legs. 41cm high, 127cm wide, 51cm deep. Heals and Son. 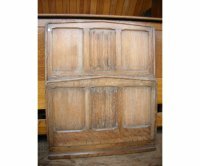 A Cotswold style oak 2 door dwarf cupboard by Heals made from 1/4 sawn oak with original Heals Ivorene makers disc. Height 42", Width 36", Depth 18". Circa 1920. A superb set of Arts and Crafts fire utensils by Gordon Russell. Height 31", Width of base 8". Circa 1900. 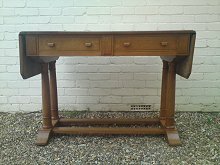 A Gordon Russell Oak twin pedestal desk, a high quality well designed work of art and marrying 3 woods together. The English Walnut top and curved ribbed front flanked by 2 full length almost elongated drawers with 1/4 sawn oak linings with perfect hand cut dovetails and 2 pedestal cupboards below all with bog oak handles sweetly incorporating the escutions opening to reveal a bank of 4 filing drawers and conforming ribbed detail to the base. Height 30", Length 52", Depth 27 1/2". Circa 1930's. 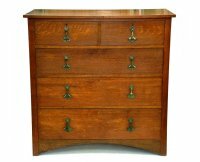 A Gordon Russell desk top set of drawers made with English oak and English Walnut with English Walnut sculptured handles. A Heals and Son oak Arts and Crafts wardrobe with central peacock inlaid with ebony, pewter and mother of pearl. Brass strap hinges and handles. Width 6' 4". Height 6' 4.5". Depth 22". 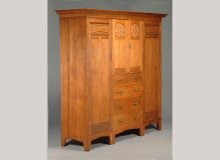 A superb quality Arts and Crafts 1/4 sawn Oak linen press of good proportions in the Cotswold style known as 'The St Ive's' designed by Ambrose Heal and made by Heals and Son. The flaring cornice with square detailing below with iron strap hinges and iron latch handle to the large cupboard doors with conforming iron handles to the 2 over 2 drawers with heart shape escutcheons, the whole on turned feet. Width of cornice 47 1/2", Depth of cornice 22 1/2", Height 75".Circa 1900. Ambrose Heal. An Arts and Crafts oak towell rail 1 of the very first pieces he designed for Heals, ensuite with the above pair of chairs. Height 31", Width at foot 12". Length 33". Circa 1897. 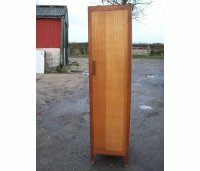 A top quality single oak Arts and Crafts wardrobe by Heals and Son. 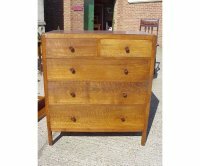 A top quality chest of drawers by Heals and Son with good proportions. Height 41",Width 36", Depth 18 1/2". Circa 1900. 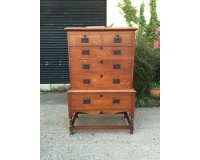 A little Heals and Son limed Oak bow fronted chest of drawers on legs with carved decoration and ebony handles to each drawer. Circa 1900. Width 36", Depth 21", Height 32". 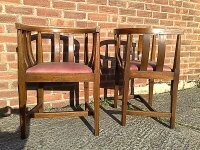 A set of four Heals and Sons Arts and Crafts oak latice back dining chairs. Attributed to Heals. A good quality 1920's figured Walnut glazed bookcase with shaped cornice and hand made bowed glass to the upper section with four cupboards below on plinth base. Height 79", Depth 17" Width 51 1/2". Circa 1920's. Ambrose Heal. An important Laurel wood glazed bookcase designed by Sir Ambrose Heal in 1929 from the signed series edition, the label inside the lower door is signed by Ambrose Heal's own hand. Including the original Heals and Son label when I presume it was exhibited at Heals which reads :- No. D39A5Y, 36" Laurel Inlaid Bookcase : NOT FOR SALE all written in ink. The sculpturally shaped top with five circular inlaid Abalone details and two diamond shaped Abalone inlays all united by Ebony string inlays with fourteen further Abalone inlaid diamonds seven to each door and Ebony string inlay and Ebonised detailing to the outer edge of each door and to the inner glazing bars. The bottom section breaks forward with two side by side slides each with an ivory handle. Height 78", Width 36", Depth 18 1/2". Circa 1929. 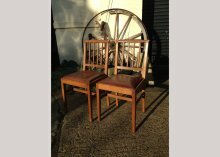 A pair of rare Arts and Crafts oak rush seat chairs designed by Ambrose Heals. These chairs are one of the first pieces he designed for Heals and Son, a sculptured chair with a simple heart cut-out and beautiful front legs which go from square at the top to octagonal at the bottom into an octagonal bun foot. These chairs have Voyseys influence of Hearts and simplicity, a wonderful design. 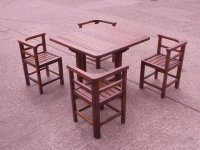 A rare classic Heals and Son Teak garden suite of superior design with square chairs that fit neatly away under the table. Length 36", Width 36". Circa 1920-30's. A Heals and Co Arts and Crafts oak bedroom suite of superior quality inlaid with Ebony and Pewter designed by Ambrose Heals. Wardrobe Height 76 1/2", Depth 24", Width 79". 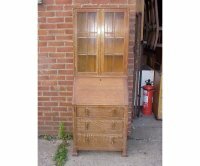 Dressing table Height 60", Width 42", Depth 21". Circa 1898. 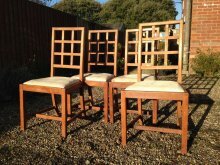 Good quality rare pair of Heals and Co Oak lattice back music/breakfast bar stools. Gordon Russell, Broadway Worcester. A set of six Cotswold School Arts and Crafts sculptured oak tub chairs with curved horse shoe top, shaped slats and fine chamfering to the legs with a drop in leather seat professionally re-upholstered in a quality Burgundy hide. 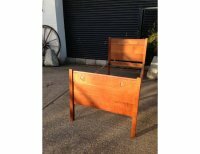 A pair of Heals and Son Oak Arts and Crafts side tables. height 28" width 22" depth 22". Circa 1900. Gordon Russell. A set of Cotswold School hand wrought iron fire utensils. Dogs. Height 10", Width at feet 6", Depth 7 1/2".